Encapsulation is all about wrapping variables and methods in one single unit. Encapsulation is also known as data hiding. Why? Because, when you design your class you may (and you should) make your variables hidden from other classes and provide methods to manipulate the data instead. Your class is designed as a black-box. 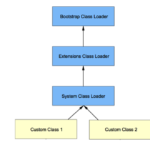 You have access to several methods from outside (classes) and a return type for each of those methods. All you need to know about this class is the name of the method and the return type. In other words – you give the class some data and get new data as response, without caring about the internal mechanisms the data is processed. Encapsulation is one of the four major concepts behind object-oriented programming (OOP). OOP questions are very common on job interviews, so you may expect questions about encapsulation on your next Java job interview. 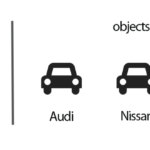 The main program creates a Car object with given name and use the setter method to store the top speed for this instance. Now we can easily get the speed in MPH or KMH without caring about how speed is converted in the Car class. The users of a class do not know how the class stores its data. 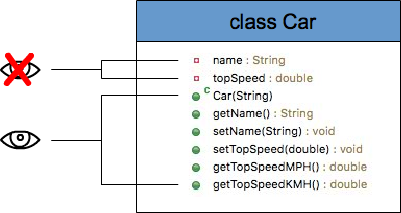 A class can change the data type of a field and users of the class do not need to change any of their code. Java Basics encapsulation, java, java job interview questions, oop. permalink.